Give your customers the opportunity to use the "So collissimo" means of shipping! 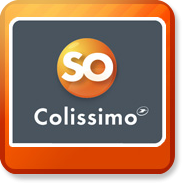 So Colissimo is a multiple-choice shipping service, at home or out of home, in France. Your offer them the possibility to choose their mode of delivery (in mailbox or in hand, by appointement in the evening) or out of home (in Cityssimo spaces, in the post office of their choice or in one of thehops of our network partners). These options represent a choice of more than 13.000 collection points throughout France.